Hello everyone and welcome to the first blog hop that I am taking part in as part of the Go for Greece Training Group run by the lovely Kylie Bertucci. This group is amazing and consists of demonstrators from all over the world that have come together to work on business goals and trying to earn the incentive trip that Stampin' Up! offers each year. Kylie provides amazing training and there are talks from some of the world's top demonstrators. 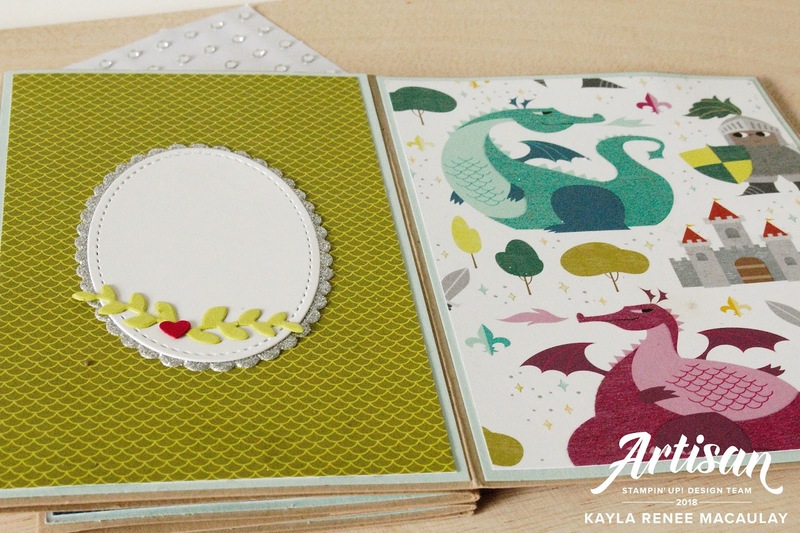 The community within Stampin' Up! is another amazing reason to join such a fabulous company. I have made life long friends that I will have for life! So we are looking forward to sharing with you some projects to inspire you all. Please be sure to check below and see all the blogs from around the world that have taken part. I hope that it inspires you to get creative. Today I am sharing with you a bit of an interactive fold out card that I made for a recent class/bingo event that I held at my home. 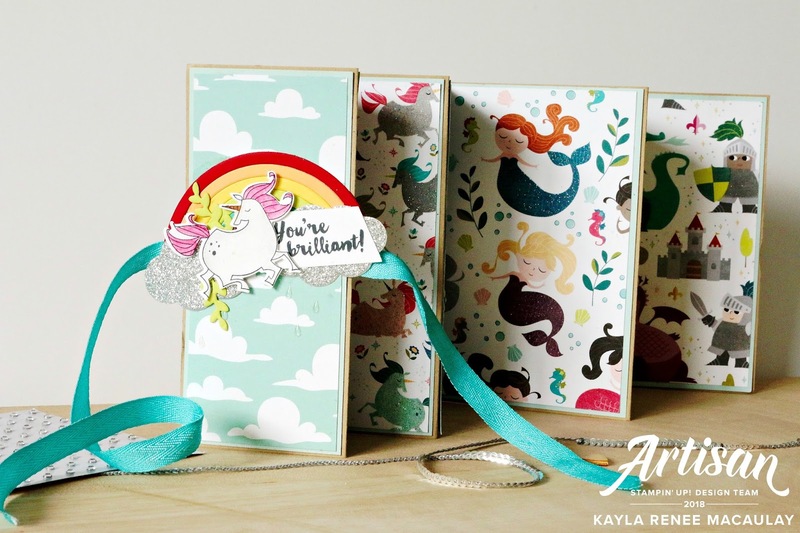 I wanted to create something that was a little different and had a lot of room to write and showed off the fabulous speciality Designer Series Paper from the Myths & Magic suite. This paper is beautiful and has lots of glittery and shiny accents. It's great for kids and the grown up kid inside us all! Here is a picture of the card when it's all folded up. I love that is gives you a peek of all the beautiful papers on the inside. 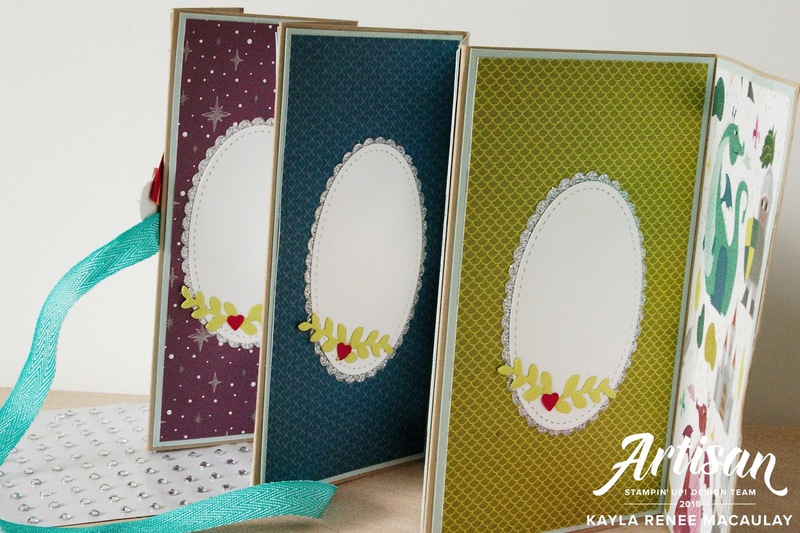 This card I created off a tutorial by the lovely Dawn Griffiths which you can see here. A close up of the front of the card showing off some of the embellishments. 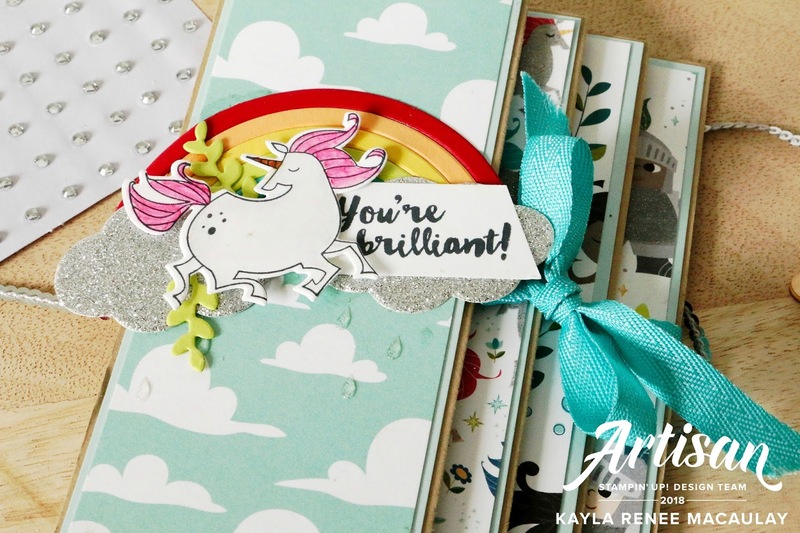 I thought nothing better goes with unicorns that a beautiful rainbow which I have created using the Rainbow Builder Framelits using a beautiful collection of colours; Real Red, Peekaboo Peach, Daffodil Delight, Lemon Lime Twist, Bermuda Bay, Fresh Fig & Flirty Flamingo. 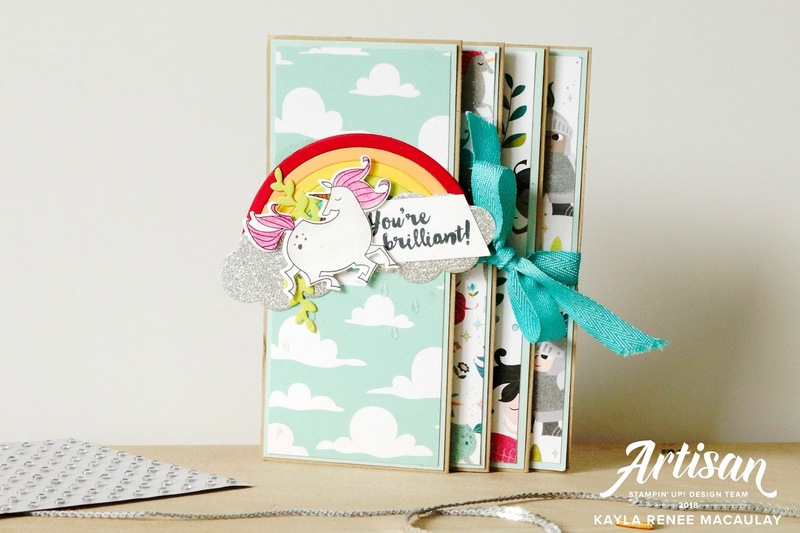 I added some fluffy clouds from the same framelits using the beautiful Silver Glimmer paper. I added some Lemon Lime Twist vines from the Magical Mates Framelits and finished with some Glitter and Clear Epoxy Dots, which come in the coolest raindrop shapes. Here's a look at the first layer of the inside of the card. I used the Oval Layering Framelits Dies combined with the Stitched Shapes Framelits to create a space for a special message to be added. 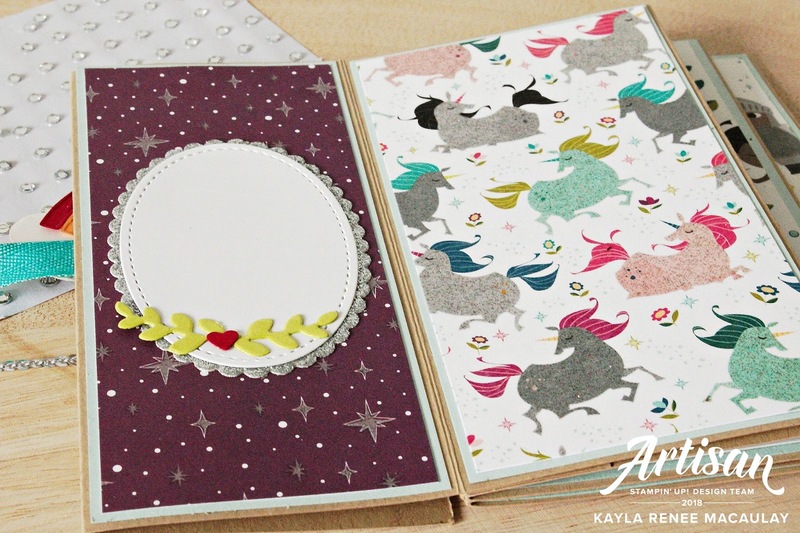 I started my card with the beautiful coordinating glittered unicorn DSP. 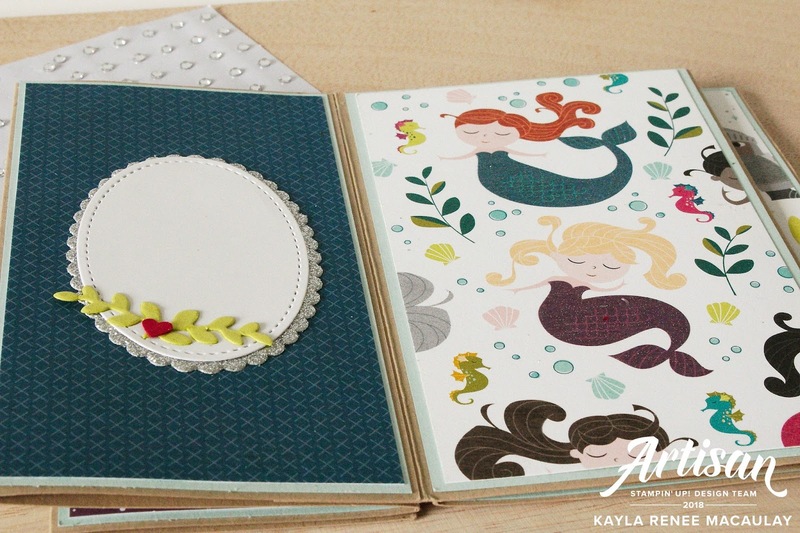 Here's the second layer of the card featuring the beautiful mermaids. And the last layer of the card featuring some fun dragons. The final picture shows the finished card from another angle which you can see how they look all together. I hope that inspires you to get creating. Also did you know that you can earn this speciality paper FREE at the moment with a $90 order.